The Visitor Centre is the main Information Point for Wild Nephin Ballycroy National Park. It opened in 2009 and has welcomed visitors fro m all over the world to Ballycroy and County Mayo. 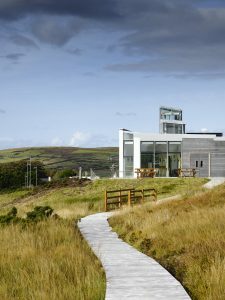 Relax and enjoy the hospitality of Wild Nephin Ballycroy National Park Visitor Centre which houses an interactive exhibition, experienced guides, Ginger & Wild Café and the accessible Tóchar Daithí Bán Nature Trail (2km). We run Special Events throughout the year and regular Guided Walks and Kids Clubs during the Summer months. Keep an eye on our News & Events page for upcoming walks, talks and activities. Please note that there is only ONE looped walk available from the visitor centre which is 2 km in length. For more information on longer walks and hikes around the parks grounds please click here.